This is a product that could have easily come out in the Beatles late '60s heyday, with gated reverb drums giving this statement a big, cavernous sound. I've always wondered where John Lennon would have gone with his music had he not been so mercilessly cut down in 1980. Would he have retreated back into film work, such as what his fellow Beatles bandmate did in Paul McCartney in 1984 with Give My Regards to Broad Street, which is, by most accounts, pretty terrible? Or would he have joined a supergroup along the lines of George Harrison with the Traveling Wilburys? Well, at this point, it's all merely conjecture, but Lennon's youngest son, Sean, offers a clue on the latest release from his ongoing current project, The Ghost of a Saber Tooth Tiger: John would have beat the retreat into the realm of psychedelic rock. 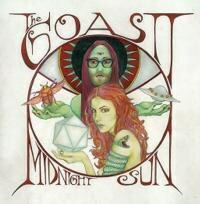 The ghost of John Lennon hovers strongly over Midnight Sun, the band's latest release. An outfit that is the collaboration between Sean Lennon and his girlfriend, musician/model Charlotte Kemp Muhl, Midnight Sun is an album practically dripping of the hippy, dippy late '60s. It's an astonishing listen, from front to back, and is remarkably cohesive in its singular vision. Pull out the bong for this one folks: mixed by none other than Dave Fridmann, this is a record that brings to mind the singular vision of the Flaming Lips with a dash of Tame Impala to the proceedings. But Midnight Sun also feels much older than that. This is a product that could have easily come out in the Beatles late '60s heyday, with gated reverb drums giving this statement a big, cavernous sound. If anything, Midnight Sun is one big throwback with a solid sound that recalls the music, accurately, of a bygone era. In fact, "Don't Look Back Orpheus" feels in some respects like a merry-go-round broken down. This is face melting music, to be sure. But it also accurately conveys the feel of Sean's father's lineage, and while one wouldn't want to make a big deal out of this fact, one cannot help but escape the notion that this is music being made by the son of a lost Beatle. And, perhaps surprisingly, a few of the songs are undeniably catchy and made lodge a hole inside your cranium: "Xanadu" and "Animals" being Exhibit As in that regard. This is powerful and towering stuff to be sure. While opening cut "Too Deep" feels a little truncated at two minutes and a half, it makes it clear who Sean's lineage is. "Xanadu", NOT a cover of the Olivia Newton-John and ELO song, is a giddy and infectious stab at Eastern music influences. "Animals", meanwhile, is probably the most Lennon-esque moment on the record with its references to Christ. "Johanneburg" sees Kemp Muhl take lead vocals for the first time, and, here, she sounds a little like Charlotte Gainsbourg. It's a giddy and infectious track. From there, the album heads into Tame Impala territory with the title track, which is rollicking and rocking in equal measure. "Last Call", meanwhile, all six minutes of it, is a proggy song that is staggering, and is an amalgamation of John Lennon with Harrison guitar histrionics during the chorus. "Devil You Know" is the most Emmit Rhodes-esque song to be had here, with its liquid-y vocals buried under a gloss of water. "Golden Earrings" is a stab at neo-soul and is affecting. "Great Expectations" is simply great and earworm worthy. And while much has been made of "Poor Paul Getty" being the spiritual antecedent of "Maxwell's Silver Hammer", with its references to cut-off ears, which might be the record's sole nod to John Lennon's songwriting partner. "Don't Look Back Orpheus" is a much more countrified number, with a nod towards pure psychedelia. And the album ends on the nearly seven-minute long extended epic "Moth to a Flame", which seems like the perfect goodbye to this near-masterpiece, lodging itself deep inside your skull. When all is said and done, Midnight Sun is a near perfect album. It remains wholly consistent, and evokes a certain time and era of music that doesn't often get heard very much anymore. It also offers an opportunity to wonder about where John Lennon's musical linage might have gone, had he lived. There is much staggering stuff to be heard on this album, and it forms a statement of artistic intent that should bode well with future releases from the Ghost of a Saber Tooth Tiger. This is an authentic throwback to sounds of a particular era uprooted and made special in the most modern day and age of music. This is heavy, moving stuff, and does a great deal to cement Sean Lennon's legacy as a musician, let alone being the son of a Beatle. There is much that is interesting about the record, from its loopy production techniques to its actual songwriting. But, more importantly, Midnight Sun cements the notion of the Ghost of a Saber Tooth Tiger as being an actual band. This is a record that gets more and more enjoyable on repeated replays, and showcases a certain love for a particular form of musical artifact. If John Lennon were alive to appreciate this work of mastery, I am certain that he would more than heartily approve. Midnight Sun is a monumental gem of an album, and I cannot more heartily give a thumbs-up to this retro-infused throwback of the late '60s and the summer of love, and it is more than apparent that a lot of craft went into this work of belaboring. This is something that more than deserves to be heard, and I commend both Sean and his girlfriend for making what is, more apparently, a work of pop songcraft that straddles the line so effortlessly between the past and the present. Midnight Sun is a true jewel, and worthy of the linage of one member's predecessor.